Clive Duncan was born in 1944, and his focus for the past forty-five years has been making, teaching and discussing sculpture. Following his studies at Camberwell School of Art, London, and City & Guilds of London Sculpture School, as well as having been a Sculpture Assistant to Kim James, Uli Nimptch RA, David McFall RA, James Butler RA and Cubitt Bevis FRBS, Duncan became a dedicated teacher himself - tutoring many now recognised sculptors - having recently finished as the Acting Head of the Fine Arts Department of the Sir John Cass School of Art. 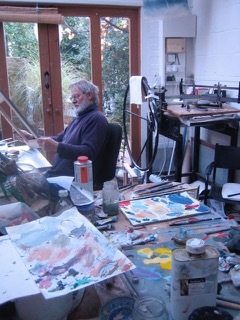 His work has been exhibited numerous times since 1968 at the Royal Academy Summer Exhibition, and the artist has been commissioned for a number of pieces over this period, including portraits of Myfanwy Piper and Sir John Mortimer, as well as producing the Trafalgar Crown Coin for the Royal Mint. Duncan has also worked with Sotheby’s London as a Design Consultant and continues to give public lectures, for instance at the Victoria & Albert Museum and recently at the National Portrait Gallery. 1969 - 1971 Lecturer in Sculpture, Drawing and Anatomy Heatherley School of Fine Art, London. Head of School. 1971 - 1972 Heatherley-Wilson School of Art. 1973 - 1993 President. Thomas Heatherley Educational Trust 1993 - External Assessor for Sculpture Diploma. 1993 - Heatherley School of Fine Art, London. 1974 Guildhall Art Gallery, London. 1996 - 2007 Royal Society of British Artists. Mall Galleries. Museum and Art Gallery of Reading. Patrick Telfer Smollett. St James, London. The Snowdrop Bronze Figure. Snowdrop Garden, High Wycombe, Bucks. The Child Bereavement Charity. The Portland Sculpture Park, Dorset. A retrospective exhibition of the work of Raymond Lowey including his work for the NASA Space Programme. The interiors of the Saturn and Shuttle vehicles.